OK, like it or not, winter is here. I admit that the first few weeks are great because you get to bust out all the stylish bulky sweaters and cute boots, which become the winter uniform. However, that loses its luster around the end of January because quite frankly, I need more creativity and inspiration. The other day my boss asked me what I thought about boots with skirts, as she was considering an outfit that would go from day to night (‘tis the season). “Ah yes, boots with skirts, I’ve been meaning to do an article on that!” We’ve seen it for some time now: knee boots and skirts have been popular for a good 15 years, booties (also called ankle boots) with skirts have been popular the last 3-4 years and going strong, and midi boots (the trickiest to pull off) are the latest craze. All boots are not only a great fashion statement, but also necessary in cold climates. For some reason though, getting completely comfortable with each of these looks takes some time for women, mostly because our eyes have been trained to create a silhouette with heels -- that gets chopped up when you add that knee or ankle boot. With the ankle boot especially, getting used to a bulky look on your foot is not instantaneous. Here are some quick tips and inspiration for wearing boots to work. 1. For an ultra-sophisticated look, wear a pencil skirt paired with an ankle or midi boot that has a smooth, polished or patent leather, suede, or even velvet material. Avoid nubuck or weathered leathers if you work in law, finance or business formal workplaces. The ankle opening should also be fitted against the ankle and any length is fine. Black is a staple in the winter wardrobe and for a longer silhouette I personally love a beige bootie. The silhouette comes from the blending of the tan color with your skin, therefore creating a ‘naked foot’ that goes all the way to the floor. Plus, light color booties make your ankles look skinnier. 3. A-line skirts look great with ankle boots, since the fullness of the skirt makes your feet and ankles look smaller. 4. A darker color ankle boot will bring your eye to the foot and can cause you to look bottom heavy. Midi boots in darker colors can combat that, because they climb further up the ankle and slenderize. A midi boot paired with a midi skirt is THE look -- especially with a slit (although not the best option for work). Select a boot that is roomier in the ankle with a flowy skirt, and a boot that has less room in the ankle for a pencil midi skirt. 5. Bare skin is a great look and acceptable in a business casual environment, but it’s too cold and some of us lose any color we had in the winter. Although I don’t “fake bake,” I avoid a pasty white look if I can help it. Hosiery that is tan or any type of skin color is OUT and colored tights are WAY in – plus they’ll keep you warm. For a formal business environment, black tights are the most acceptable and create the longest, most slenderizing silhouette when paired with black ankle boots, regardless of the color of the skirt you wear it with. 6. As for tall boots at work, I don’t wear them if they don’t come up to the knee or above it, and I always wear them with skirts that overlap them. So basically, my boots are my legs, if you catch my drift. Otherwise the boots will cut you off and you won’t look as slender. 7. 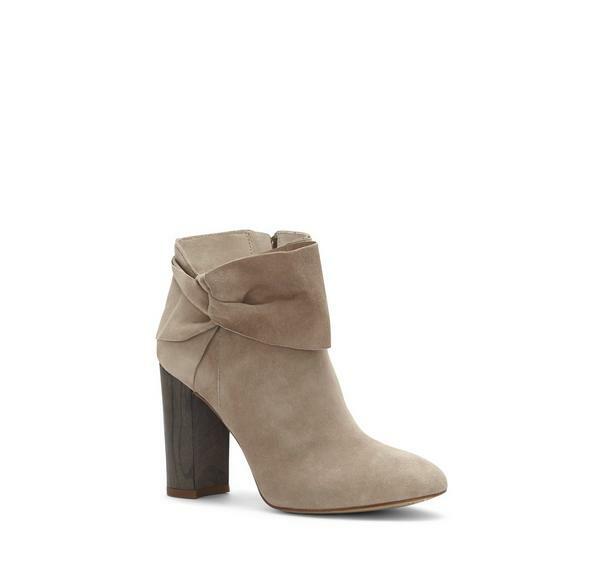 If you wear wool, printed/patterned, denim, or other wintery skirts, DO add a great-looking pair of suede booties to that look. With all the great boot styles available, it’s hard to know what to pick and what’s going to be the most versatile with your wardrobe. Start with boots the same color of the heels you wear the most. This will ease you in and give you lots of outfit options that you already own. Good luck and leave me comments on your unique style.